Earrings, studs, decorative tubes and other adornments are worn by people the world over to enhance beauty and establish status. Unfortunately, many of these people ultimately end up with elongated earlobes and partial and complete tears in their ears? Many wear earrings that are too heavy, hang low, or have them pulled out by their young children. There is no downtime and there is little to no pain afterwards. You can bathe and exercise normally. Use common-sense when considering activities. Mixed Martial Arts is frowned upon! 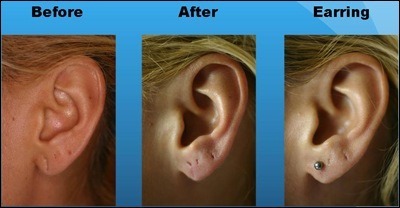 After the initial three weeks, the studs can be removed and small regular earrings can be used. Heavy earrings can be used after the 6 week period. Lightweight earrings should be the standard from here on out. going back to heavy earrings will simply re-tear your repaired lobes and bring you back to our office. remember to remove your earrings when hanging out with young children!